Karuba is a nice little game. We liked it! We liked it to the tune of three and a half stars, each of which was pried out of the eyes of some devotional idol standing guard in a dark temple somewhere unspecified. It’s got a lot of energy, and a lot of heart. 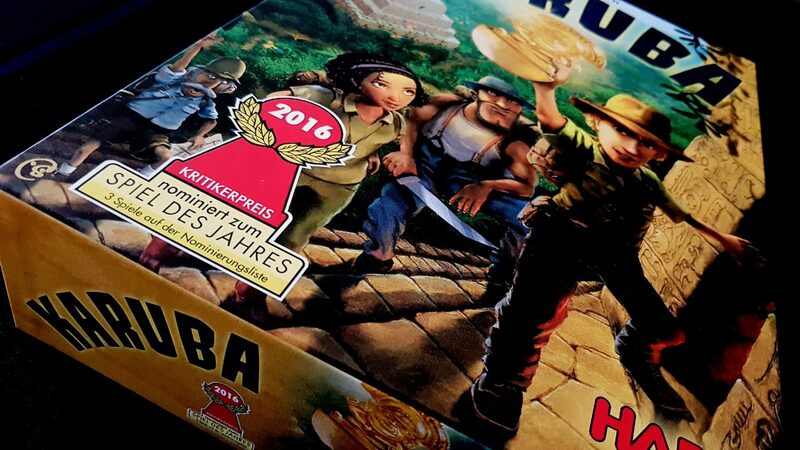 It’s a Spiel des Jahres nominee too –there are lots of reasons you might be interested in exploring how easily it can be played. Unfortunately, to find out the answer we need to navigate the dangerous jungle of this teardown. Grab a machete – you’ll need it to hack your way through these thick, fibrous tendrils of pomposity that are masquerading as insight! 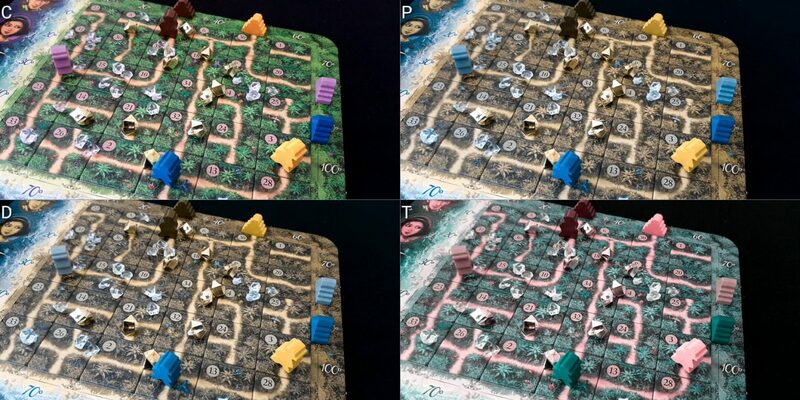 It’s almost textbook stuff here – Karuba is a nearly perfect example of a game handling colour blindness well. It will suffer somewhat if monochromacy is to be taken into account but that is an extremely rare condition. For everyone else, what might seem like a curiously whimsical selection of colours is actually a superb accessibility aid. 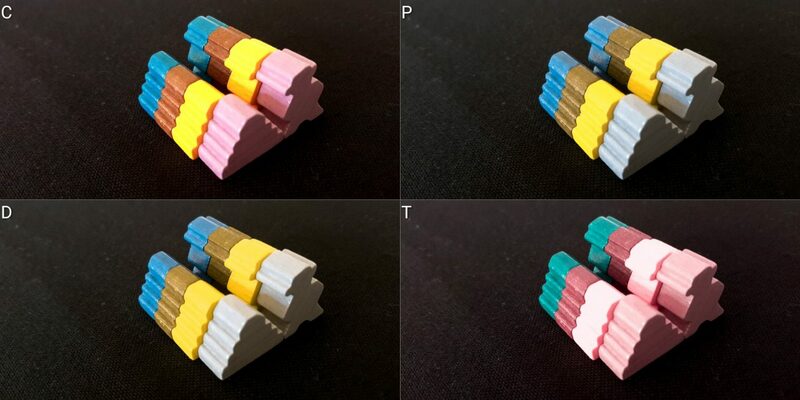 True, when considering Tritanopia the yellow and purple meeple do overlap a little and may be difficult to tell apart in poor lighting conditions. Bear in mind though there will only be four of each temple and meeple you need to consider on your board. It’s manageable. The island tiles don’t use colour as a key channel of information – instead, they are primarily differentiated by their numerical identifier. As such, when you place tiles on the board the only thing colour does is change the aesthetics. Many such games with a green, pastoral graphic design look vaguely apocalyptic when viewed through the lens of Protanopia or Deuteranopia. Karuba, on the other hand, actually looks like you’re searching for temples on a nice, sandy beach. Overall a very good performance here. Karuba is strongly recommended. 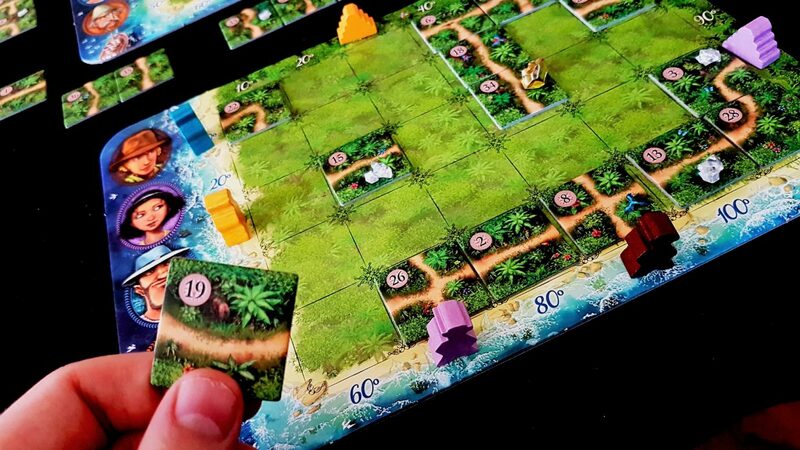 Tile laying games like Karuba all share a common inaccessibility in this category – you spend a lot of time scanning tiles for optimal placement. Karuba at least adopts a set of conventions that limit some of the worst problems here but you can’t get around the fact that tile placement is largely an exercise of visual parsing. Those with total blindness, as usual, will likely find the game entirely inaccessible. So, good stuff first – the tiles that come out are all going to come out in the same order for everyone, and they’re numbered. At the start of play, everyone except for the expedition leader will have their tiles arranged around their board in a set numerical order to ease in the selection. The expedition leader will have a stack, and simply draw the top one from it. This means that finding the tile to be placed is relatively straightforward, and even possible to do by touch if they’re separated out enough. Setting them up in this way is a painfully awkward process, but it’s much easier if a sighted player can handle that part of play. But again we come down to what happens after you draw a tile – you need to work out where it’s going to go to best advantage your play. That involves a degree of network evaluation – working out which adventurers need to connect to which roads, and how they’re going to traverse those roads and in what order. If you want to play competitively, you’ll also need to look over at the other islands being explored and see where you run the risk of someone beating you to a temple. Consider the image above – where is it best to play that tile? You might think to hook it at 10,30 (just in front of the yellow temple) to make that accessible to the main path. That is until you see that your yellow adventurer then needs to connect up to the southern-most road and follow it through eleven tiles to get there. A direct route may require only six moves otherwise. Is that a problem? It depends on whether anyone else has a more direct path between yellow that they’re working towards. Maybe instead you want to put it at 20,10 – that would hook blue up and start tending the path in the right direction. But what tiles do you have left after that happens? What are the chances you’ll get the necessary tiles to connect blue up to the main path while still leaving yellow free to make the journey? Do you have to do that? Maybe blue can take the direct route and yellow could take the longer route to the south. Does that make sense? It all depends. You can understand I’m sure why this kind of decision tree might give me pause for thought in this category. There doesn’t need to be a time limit associated with this processing and the board is going to be right in front of you (at least your own). You don’t need to especially strain to see the island, in other words. If you have a suitable assistive aid, you can perform as much close examination as required on the board in front of you. There is though a lot of information to consider and almost all of it is most easily obtained visually. Some important game state elements too will be on the other side of the table if you are intended to mold your strategy around that of your opponents. One lovely feature of play is that the gems and gold nuggets (and the treasure tokens) are all easily differentiated by touch. They all feel very different, and the gems and nuggets are placed on tiles as they’re played. This lets someone (if they’re careful) physically explore along paths to feel how many points are available to collect. As the denomination of treasures decreases, so too does their size. There is an explicit link between size of the token you’ll pick up and the number of points you get for it. There’s no written text in the game other than numbers, and these are always present in the same place on the tile. The fact that tiles too have a fixed orientation solves a problem that often exists in tile placement games – that is to say the combinatorial explosion effect caused by having to consider all the placement possibilities in all the possible orientations. Tiles in Karuba are placed down with the number in the top left. The number is well contrasted, although quite small on the tile and overlaid onto a background that’s busier than I would like. It’s a mixed bag then, but overall we have to say that given the amount of visual information you need to be managing on a regular basis we can’t recommend Karuba in this category. There is a very challenging game in Karuba if everyone wants to play competitively. We remarked in the review that one of the common criticisms we see levied at the game is that it’s basically a kind of solitaire multiplayer game of Carcassonne bingo. That view is certainly understandable, but if you want to play the game well you need to be constantly aware of who’s building what paths and where they’re planning to go. That’s how you make sure you’re always there first, grabbing the best treasures and urinating on the best trees to mark your territory. This constant thread of criticism though reveals an important truth – you can play Karuba perfectly well without worrying about what anyone else is doing. You can just build paths and pick up gems and enjoy yourself without needing to be doing what’s within your limited power to undermine your opponents’ efforts. Tile laying games are often fun in and of themselves as an act of limited creation. It can be enjoyable to just construct a nice landscape, especially if you can then send people happily wandering around it. Karuba leans into that although there are a number of things that need to be considered before we get to the conclusion. The first of these is that numeracy is a requirement for independent play – players need to be able to pick tiles based on the number that was just announced. However, the tile placement for everyone that isn’t the expedition leader means that it’s easy for other players to help with this – they’ll know exactly from where a player will need to extract a tile, and can lean over and assist in this if necessary. The numeracy of addition is also required for scoring, but it’s relatively easy to substitute this with physical cues. For example, you might give a player two diamonds instead of a gold nugget, or substitute a treasure with its value in gems. That turns addition into a counting exercise without losing anything of the game. Now, that’s not a trivial thing – route planning is largely an act of holding a varying model in mind that lets you link the tiles you have available to the routes each of your adventurers will need to take. Optimising this is cognitively costly made more costly when considering the fact that tiles are also your movement budget. However, you can go a good way in Karuba by building routes based on the immediate tactical availability of tiles. It won’t mean you have the best possible routes, but you’ll manage to make good routes easily enough. For all the other cognitive issues I might find somewhat troubling, there are accessible workarounds. 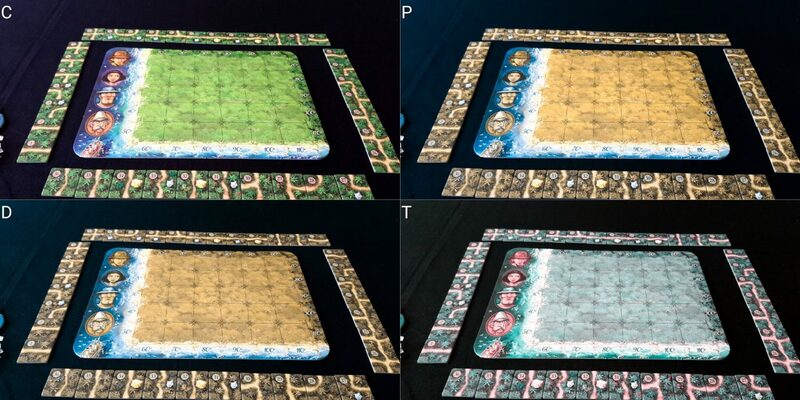 To reduce the cost of tile assessment, you can give each player a set movement budget or simply let people move one adventurer per turn regardless of tile drawn. That makes the game less difficult, but also halves how much you need to think about what you want to do with a tile. To dial down the volatility associated with the temporal economy of the tiles, you can simply give everyone the same number of points for reaching a temple. Indeed, this is what the rules state for when two players enter a temple in the same turn – the first person to do it gets the larger token, and the other gets the next token and the balance made up in gems or gold. We’d be inclined to tentatively recommend Karuba in its out of the box state in the fluid intelligence category, and happily recommend it in the memory category. If you were willing to make some small accessibility adjustments as outlined above, we’d bump each of those recommendation up a grade. As it is, we’ll split the difference for our final recommendations. I don’t see a lot of worry areas here – there are no ways in which players can interfere with each other except in getting to the temples before someone else. Even when that happens, you don’t lose out on a treasure – you just get one with a lower value. The difference between being first to a temple and being last might only be three points, and if you picked up a gold nugget and a diamond on the way you still come out even. You’re all sharing a game state and even an order of tile placement, so while luck is an important element of tile draw order it’s not something that differentiates one performance from another. Depending on your perspective, that might be good (nobody feels unjustly screwed over) or bad (nobody can blame poor performance on the roll of a dice). 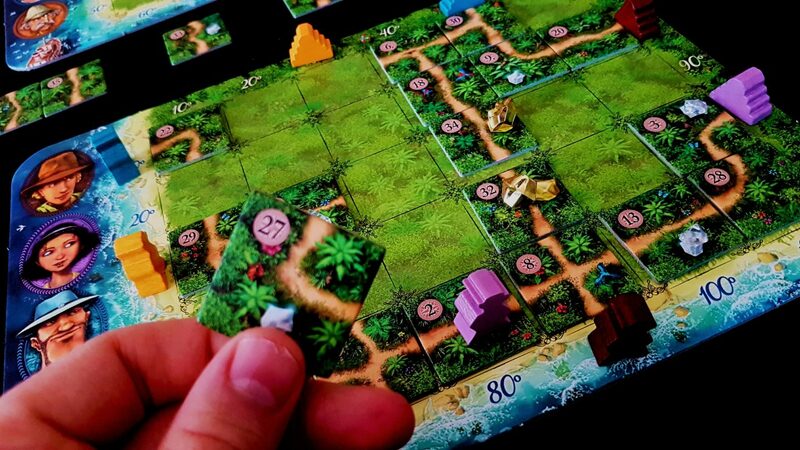 One of the elements of the game that might be a problem depending on the emotional issues concerned is that Karuba is a tile laying game that is going to leave some parts of the board uncovered, or roads that lead to nowhere, or start from nowhere. Those that feel a strong need for closure or symmetry may find that uncomfortable. Even those that don’t especially have a need for that sense of completeness may still feel a little discomfited if coming to this from games like Carcassonne where road alignment is critical. Otherwise, it’s a clean bill of health – the low competition model means ganging up isn’t possible, there’s no take that system built into play, and player elimination itself is eliminated. Score disparities can be significant if someone doesn’t manage to get to any temples (that’s possible, although unlikely) but otherwise tend to fall into a relatively small window. First to a temple in a four player game gets five points. Fourth place gets two. The chances are good though that if you miss out on one temple you can get to another early and make up for it. We’ll strongly recommend Karuba in this category. When playing Karuba you’re placing tiles in a reasonably tight grid and an inadvertent jerk of the fingers can easily create an alignment cascade that goes through the entire island. It probably won’t upset permanent game state, but it can certainly make placing later tiles more difficult if it doesn’t get tidied up. Considering that your tiles may be housing gems, gold nuggets, and adventurers you can knock things around quite a bit without much effort. Picking up tiles from the stack or your chain of tiles can also require relatively fine grained control, although both of these things can be made more accessible with relative ease. A heap of tiles that someone picks from randomly works just as well as a stack, and you can leave as much room as is feasible around tiles if you’re drawing them from your allocation based on someone else’s random draw. Gems and gold nuggets are very small, very light, and easily knocked around. You only need to pick them up occasionally, but when you place a tile that displays one of these on the front it should get an appropriate token to go with it. Since they just rest on the top of the tile, it makes for a potentially fragile game state although it also means that you have visual clues as to where they came from if they’re knocked about. Otherwise the key element of interaction is in moving your adventurers around and that takes place over a relatively constrained area. Each player has their own island which means that you don’t need to worry about the game state sprawling out of control. It’s all going to be displayed right in front of you. The same thing that makes tile placement a little difficult is going to be the thing that keeps the tiles in an easy to reach radius. Verbalisation if required is supported very nicely through the use of a co-ordinate system on the board. All you’ll need to do is come up with a convention as to which number comes first and which comes second. You don’t even have the slight awkwardness of negotiating an orientation because every tile gets placed the same way around. You also don’t have to indicate which tile you want placed, because everyone is placing the same tile number. All you need to do is say what you want to do with it. Similarly with discarding, you can unambiguously reference the adventurers you want to move (by colour or co-ordinate) and plot a precise path for them either through cardinal directions or co-ordinate squares. You’ll only ever be moving them between one and four squares at a time, and often there will only be one sensible direction in which they should move. With all this in mind, we’ll recommend Karuba in this category. The cover shows men and women, although with a 3-1 ratio. It does though show the active participation of an older gentleman in the adventure, which is something I think is a nice touch in terms of representation. I also like that the woman on the front looks a bit like an adult Clementine from the Walking Dead video games. Clementine is one of my all-time favourite game characters. The issue of representation isn’t exactly quite as straightforward as usual here though. The adventurers don’t represent our characters – rather, we ourselves represent something like the spirit of the expedition. Seemingly spread across multiple parallel dimensions too, since we all have our own set of the same adventurers on different islands. That should have been the real finale of Lost, am I right? As such, the importance of players being able to take on the role of someone with which they can identify is somewhat lessened. The manual doesn’t default to masculinity, and explicitly references men and women in the exemplar text. Gendering, when it occurs, is tied to the context of men and women in the examples – everything else is in the second person perspective. Thematically, we have the faint odour of ‘looted antiquity’ here that we’ve seen in several games before – Lost Cities, Escape: The Curse of the Temple, and Forbidden Island being the keystone examples. As with these, I think you need to want to read these motifs into the game but it’s also impossible to deny they are present. It’s not like a big thing is made of it, but one has to remember that the seemingly noble call of ‘it belongs in a museum’ also carries with it the lingering legacy of Western Imperialism. Largely that’s where the museums to which an artifact ‘belonged’ happened to be. 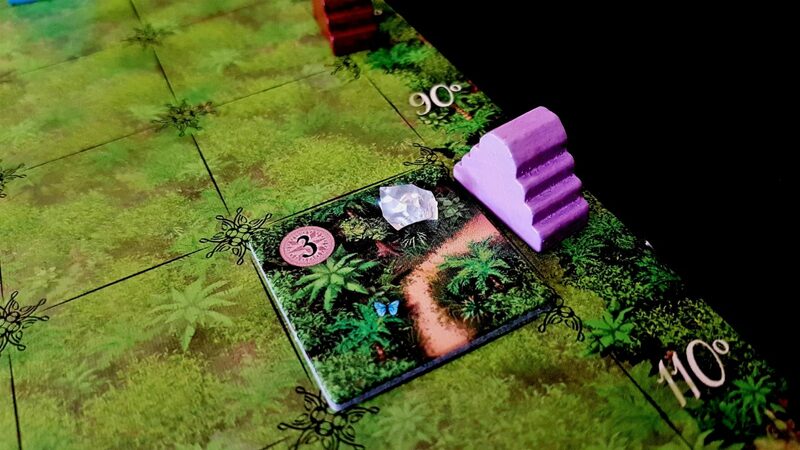 Karuba supports two to four players out of the box and works well for all those counts. It’s interestingly a game that can scale up almost infinitely too. You all have your own board and a shared game state made up of tiles and adventurers and temples. If you wanted a game of Karuba that supported eight players, you could bang two boxes together and have exactly that experience. Otherwise, for something pitched as a family game it has a hard ceiling on how big that family can be. It has an RRP of around £27, which is on the reasonable end of pricey for a four player game, and the cost to scale that up to a larger player count is a whole other box. We’ll recommend Karuba in this category. The expedition leader must be able to articulate the number of the tile everyone must place, and all the other players need to be able to clearly interpret that articulation. This is the only part of the game where communication may be an issue. Since the only thing you need express is a number there are other ways it can be accomplished if required. You could type it up on a laptop, or write it down in large print on a sheet of paper should that be necessary. We recommend Karuba in this category too. As is often the case, an intersection of communicative and physical impairment is going to render verbalisation much more difficult to effectively enact. More than this, if using an alternate system for announcing tile numbers this is also likely to impact on that regime – as an example, physical impairments may make it difficult to make use of written numbers. Workarounds are almost certainly possible in individual cases. There is though of course a point where one must consider whether the extra effort that need be expended couldn’t be more profitably spent playing a game where the interaction model is more compatible. Game length is marked down as about forty minutes on the box, but that is I think conservative. You can, under ideal circumstances, play it twice in that time period – player count doesn’t even impact this much because of the simultaneous model of tile placement. That won’t be true in situations where accessibility compensations must be taken into account, but in any case the game is likely brisk enough that it won’t exacerbate issues of discomfort or distress. In situations where it does, it is very easy for players to drop out without impact on the rest of the game. You could even play Karuba solo and have a very enjoyable time. All you’d lose out on would be the shifting risk versus reward element of time and opportunity management. 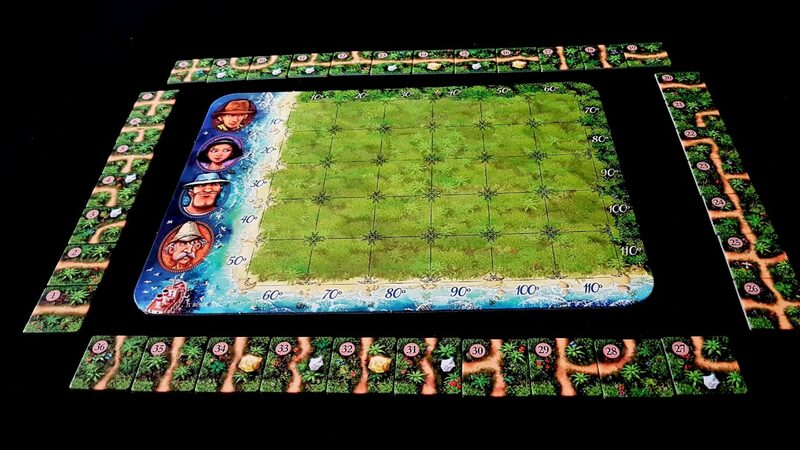 Karuba manages a reasonably strong performance across the board, with the problems in the visual accessibility category arising out of the sheer amount of information that goes into tile based route placement. It’s difficult to envisage a scenario in which a game with this kind of design could do substantively better in that category. There are some really nice touches in here too, and that is something I always like to see in a game that is nominated for a Spiel des Jahres. These games, by their very nature, are going to be more high profile than many other games and I think it’s important that they also manage to show a greater degree of accessible thinking in their design. In terms of approachability, that’s often true. In the sense of accessibility as we discuss it, that’s less often a reliable element of the proposition. 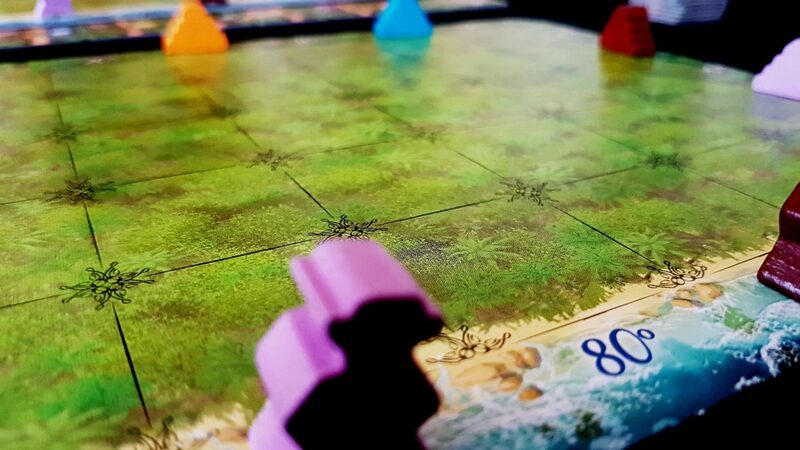 Karuba is a game you can have a lot of fun with – short, snappy, and yet with a pleasingly engaging puzzle at the core of its offering. It then gives everyone the solution and lets each player reflect at the end on how many different ways people managed to construct the context of their own inevitable failure. We gave it three and a half stars in our review. This teardown suggests that many of those that might want to give it a whirl should be able to find a way to make it work for their specific accessibility requirements without too many difficulties.